Multiple award-winning indie press, based in Nicosia, Cyprus, dedicated to publishing intelligent literary fiction with Greece and Cyprus at its core. | Great literature. One book at a time. 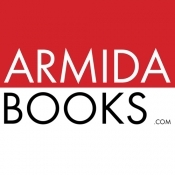 Armida Publications is a founding member of the Association of Cyprus Book Publishers (member of IPA and FEP), a member of the Independent Publishers Guild (UK) and a member of the Independent Book Publishers Association (USA). Armida's ongoing goal is to introduce the richness of Cypriot literature to the international field. Small country, rich culture! Armida has gradually grown to become Cyprus' most dynamic independent publishing firm with a strong distribution network both here in Cyprus and in Greece. All English titles enjoy worldwide distribution via the Ingram Content Group. Electronic titles distributed to all major online retailers.